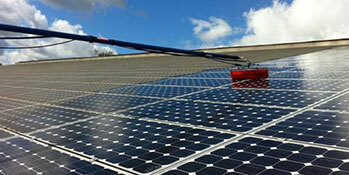 To date we have cleaned over 40,000 solar panels on ground mounts, factory roofs and residential properties in Dorset. Cleaning your solar panels on a regular basis can improve your return on investment whether it is domestic, commercial or solar farm by up to 20%, or more, depending on how dirty they are. 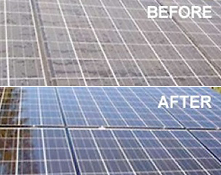 Manufactures recommend that your solar panels are cleaned every 6 to 12 months. If you have a domestic roof mounted solar array (normally 16 panels) they can be accessed from the ground without climbing on or over your roof. This is achieved by the use of an extendable water-fed-pole with a soft brush head specifically designed for solar panel cleaning. The water we use has been purified through a 5 stage cleaning system ensuring it is pure and will not leave any hard water residue on the surface which could impair the output of your solar panels. We do not use any chemicals to clean your solar panels. We also have specially trained operators to access large solar rooftop arrays by Cherry Picker. So no matter how big or small the job is we can clean your solar panels safely in accordance with the manufacturers instruction. 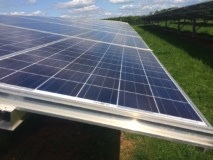 First Call are approved contractors for "Clean Solar Solutions" and cover Dorset and surrounding areas. All staff at First Call have attended the only dedicated solar panel cleaning Health & Safety training course available in the UK, organised by Clean Solar Solutions Ltd. As a result, we know how exactly how to safely clean your solar panels professionally, to a high standard and we do so in line with the warranty provided by you solar panel manufacturer. We are fully insured for solar panel cleaning.